Woodland Hills, California- This August, RLJ Entertainment, Inc. (NASDAQ: RLJE), under the Image Entertainment brand, presents a moving story about a woman who seems to have it all; a perfect marriage, a daughter at the top of her class, and an athletic son at the top of his game. But things are not always as they appear. On the very night her father dies, things begin to unravel when her son is caught drinking at a party violating the school's behaviour policy for athletics. The police and the community turn the other way, willing to allow the young athlete to bring them victory regardless of the bad lesson it teaches him. His sister's pressure to perform is no less severe. At the top of her class, she is expected to be valedictorian, but High School Latin has proven to be much harder than she expected. She finds the perfect opportunity to cheat, and wavers on the decision to be honest, or to be victorious. Inspired by the real life experiences of his co-writer, Christian Counsellor, Andrea M. Polnaszek, John K.D. Graham directs a powerful film about one family's journey toward a true relationship with God and each other, despite the pressures of the community to keep on with the facade. It will be available on DVD, Digital HD, and On Demand this August. 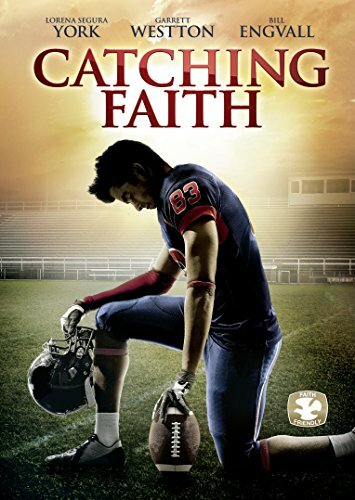 For more information or to see the trailer, go to www.CatchingFaith.com. Synopsis: John and Alexa Taylor appear to have the perfect life � they're the envy of all the parents in town. Their son Beau is the high school football star and their daughter Ravyn is a straight-A student. But when Beau is caught drinking alcohol, his place on the team and his bright future are on the line. With the football season at stake and the judgmental community turning their backs on them, every member of the Taylor family is at a crossroads. Now, they must find the strength from one another, and the spiritual courage from within, to prove that faith and family is the only score that really matters. RLJ Entertainment, Inc. (NASDAQ: RLJE) is a premier independent owner, developer, licensee, and distributor of entertainment content and programming in primarily North America, the United Kingdom, and Australia. RLJE is a leader in numerous genres including feature films and urban with distinct content via its owned and distributed brands such as Acorn (British TV), Image (feature films), Acacia (fitness), Athena (documentaries), and Madacy (gift sets). These titles are distributed in multiple formats including broadcast television (including satellite and cable), theatrical and non-theatrical, DVD, Blu-Ray, digital download, and digital streaming. Through Acorn Productions, its UK production arm, RLJE owns all rights to the hit UK mystery series Foyle's War and is developing new programs. RLJE owns 64% of Agatha Christie Limited, which manages the intellectual property and publishing rights to some of the greatest works of mystery fiction, including stories of the iconic sleuths Miss Marple and Poirot.